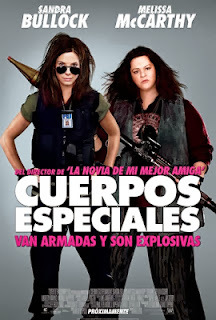 Reparto: Sandra Bullock (Katerina James), Melissa McCarthy (Joyce Nelson), Kaitlin Olson, Taran Killam, Michael Rapaport, Thomas F. Wilson (Capitan Frank Woods), Demián Bichir, Raw Leiba, Tony Hale, Steve Bannos (Wayne), Bill Burr (Boris Vulsvich), Nathan Corddry (Michael Mullins), Andy Buckley (Robin). Producción: Paul Feig, Peter Chernin, Dylan Clark y Jenno Topping. Productoras: Chernin Entertainment, Tomkats Catering y Twentieth Century Fox Film Corporation.